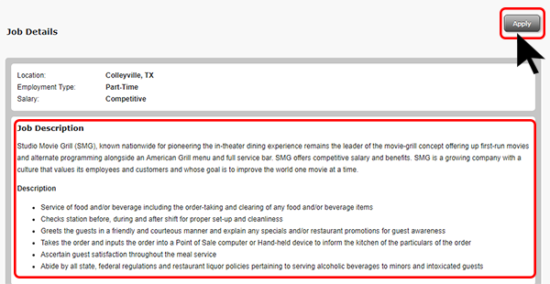 This step by step guide will walk you through the process of applying at a Studio Movie Grill near you. Studio Movie Grill is unlike any other movie theater around today. At SMG, you can order dinner and a drink in the lounge before the movie and it will be delivered to you in your seat. If you get hungry during the movie , no problem! There are service buttons at every seat so you may place an order and receive food and drink at anytime during the movie. You can even start a tab, that way you do not have to worry about payment until the end of the show. If you feel like a drink after the movie, just stop by the bar in the lounge and order yourself a nightcap before you go. Step 2 – Click on Hourly Positions. 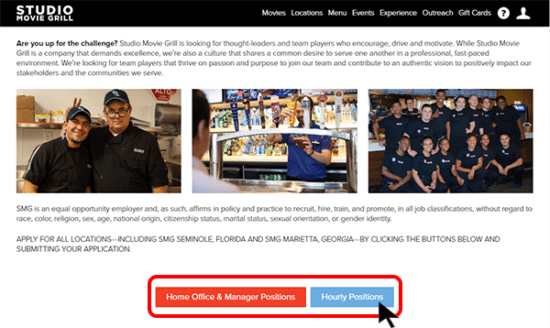 This guide will walk you through the process of applying for hourly positions. The process for applying for home office and management positions is similar. Step 3 – Click on the title of the job you are interested in applying for. You will now get a brief description of the job. (below) If this position still appeals to you continue on to step 4. If you already have an account, enter your credentials and click Sign In. Step 6 – Click on start. There are five required sections of the application. Follow along and make sure to complete each section. Step 7 – Click submit when you have finished all five sections of the application. If you need help creating a resume, we have a basic resume outlined at the bottom of the homepage of this website.